I was riding a bit last night and noticed this feeling of a "click" at this one spot in my pedals rotation. It wasn't there before. Does anyone know what it may be. It's a 2015 Orbea Avant m20 with an FSA BB. Haw can I make my baby smooth all the way around again? This link may be a good resource for you: Bicycle Bike Noises, Clicks, Ticks, Creaks, Clunks, Knocks Repair by Jim Langley Noises are notoriously hard to pin-point. As a first step, see if it goes away when you stand while pedaling. It may be time to clean and re-lube the driveline. I'm sure that's in the list of things noted above but this is, in my experience, the first thing that needs attention on a new bike. To clarify I can't hear a sound. But click is the word I guess to explain what I am feeling. The bike is new, well new to me and I didn't do it before. I'm unclear on "new" vs. "new to me". Even a brand-new out-of-the-box bike may need lube and adjustment to run smoothly. This, of course, is the dealer's job, and it should be good for at least a few hundred miles depending on how/where you ride it. A bike can need lube after only one ride if it's a dusty/dirty/muddy route or it's raining. But just "new to me" means to me that you have obtained this from a previous owner and you don't really know how well it was maintained. I'd start with a cleaning and lube and take it from there. If this is really new, take it back to the shop you bought it from and have them take care of this problem. Ok fair. Mr. Wannabe Lance bought it rode it and parked it. It didn't do it when I tested it. It has not 1 scratch and shifts like it already knows I'm about to shift... But this one damn little click feel, it's not a sound but a feeling at the same spot every rev. You really need to provide the correct info. DID YOU BUY IT IN A BIKE SHOP OR NOT? Are you the Mr. Wannabe Lance you are referring to? The only way for your new bike to not accumulate flaws of wear and tear is to not ride it. If you ride it the only way to minimize the flaws of wear and tear is to maintain it. The link to the article gives a lot of good information that you should read. Generally if the slight click you feel is at the same revolution point of the crank, I would check the pedals and crank/bottom bracket to make sure everything is tight. I have found that it typically occurs at the point where you are exerting the most power. Try to pedal without any load (coasting) and see if you feel it. If the timing is other than crank revolution it can be a chain link or some other drivetrain component. This is a rough guess, but unless you are able to fix the bike, you'll want to be able to explain what is happening when you take it to a shop. Do the quick and easy things first. I would suggest swapping your pedals for a known-quiet pair, preferably platform type to eliminate cleat noise. Also check that the click is not caused by a shoe or lace tapping something as it goes around, or the front derailleur cable end tapping the crank. Are they cottered, cotterless, or Ashtabula cranks? I had a cottered crank once upon a time that did what you describe because one of the cotters was worn/loose. 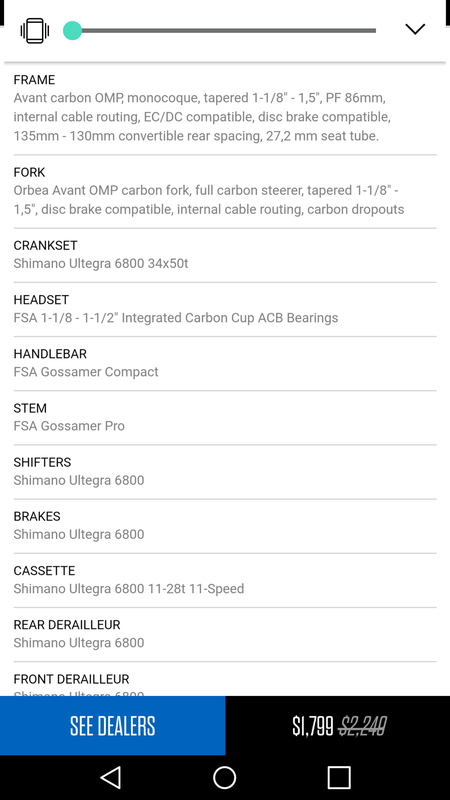 I really doubt a 2015 Orbea has cottered cranks. If you can only feel it under load I'll wager that it is the bottom bracket. Stripping down and relubricating should work (since most BBs are sealed, it is probably just a case of refreshing the assembly grease). it's a Shimano crankset in a press fit BB, which probably means adapter cups. That set up is notorious for creaking/clicking/squeaking under load. You could pull the cranks, clean and regrease everything, and then make sure it's all torqued to spec. And.... it'll probably start clicking again in a couple hundred miles. Not necessarily. The Avant M20D uses a FSA crankset. Do you know the model # of the FSA BB? Is it pressed or threded? Is this saying press fit 86mm BB? Last edited by Brandonyatessr; 05-02-18 at 09:01 PM. So I rode 27mi today and the clicking is getting worse now I can hear it click. .
At this point you should probably take to a shop. Things like this never get better on their own. It may be normal for that BB setup, or it may be something coming loose and you will ruin your crank or ??? If that is normal, it would drive me bonkers over time, so I would get it fixed even if it meant swapping out the BB.